Place : Kumily, Kerala, in the southern part of India. Major Attractions : Elephants, Tiger, Nilgiri Tahr, Nilgiri Langur. Area Covered : 777 sq-km. Ideal Time to Visit the Park : From the months of October and June. 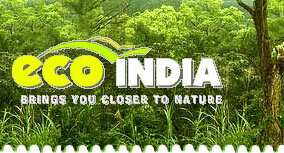 Nearest Attractions : Alleppey, Cradomom Hills, Kumily, Boat Cruises. Some Major Accesses : Kumily (4 km), Madurai (140 km), Cochin or Kochi (200 km), Kottayam (114 km), Ernakulam. The Periyar National Park and Tiger Reserve is situated high in the ranges of the Western Ghats, in south Indian state of Kerala - known as the God's Own Country. 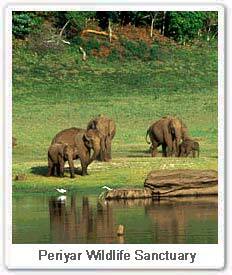 Periyar wildlife sanctuary in Kerala has a scenic lake at the heart of the sanctuary. Formed with the building of a dam in 1895, this reservoir runs around the contours of the wooded hills, providing water to the local wildlife through out the year. Though Periyar Kerala is a Tiger Reserve, tourists visit this place to view the Indian elephants in the act of sprinkling water and playfulness by the Periyar lake. The Periyar National Park was slated under the Project Tiger in the year 1972. The physiology of the Periyar National Park mainly comprises of the western ghat hills in various shapes and sizes. These thickly wooded hills are dominated by water bodies, vast grasslands and even thicker forest areas. The densely forested valleys are abound in wild vegetation and animal life. Other than the river Periyar, the park and main lake located in the centre of the park are watered by two other rivers, the Azhutha and the Mullayar. Apart from Elephants, the other animals to be seen in the Periyar sanctuary Kerala are Gaur, Wild Pigs, Sambar, Barking Deer, Mouse Deer, Dole or Indian Wild Dog and very rarely, a Tiger. There are, now, an estimated 40 tigers in the Periyar national Park. Four species of primates are found at Periyar - the rare lion-tailed macaque, the Nilgiri Langur, Gee's Golden Langur, Common Langur And Bonnet Macaque. Periyar also happens to be the habitat of the elusive Nilgiri Tahr, which is rarely to be seen. The birdlife comprises of Darters, Cormorants, Kingfishers, the great Malabar Hornbill and racket-tailed Drongoes. The reptilian population boasts of Monitor Lizards that can be seen basking in the sun, on the rocks along the lakeshore. Visitors who trek into the Periyar national park often see a Python and sometimes even a King Cobra. Boat cruises make the best option to check out the wilds of Periyar Sanctuary, as the Periyar lake presents an excellent boating spot for tourists today. Although it is uneasy to see many animals from the boats, still you come across a family of Elephants, Wild Boar, and Sambar Deer by the water's edge. Air : Kochi (Cochin) at 200 km or Madurai in Tamil Nadu at 140 km are the nearest airports from Periyar. Rail : Kottayam at 114 km is the nearest railhead from Periyar.